Mervyn King, the governor of the Bank of England, has come under the spotlight as he and the government attempted to stabilise the markets and restore faith in the banks. He has been criticised because the Bank of England, unlike the Federal Reserve and European Central Bank, initially refused to inject large amounts of cash into the money markets to help banks that were suffering liquidity problems. For the sake of his reputation and that of the Bank, King has a lot of explaining to do. Then, in a sudden about-turn following the problems at Northern Rock, the Bank decided it would put an extra £10bn into the market and would accept a wider range of collateral from the banks. Mr King also reportedly clashed with the Financial Services Agency about their desire for early intervention to help Northern Rock. Mr King had previously warned the banks they were accumulating too many bad risks, and that it would not be the business of the Bank of England to bail them out. 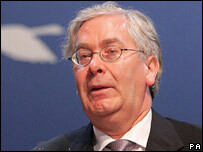 Mervyn King was appointed to the top job at the central bank following the retirement of Sir Edward George in June 2003. Before that he had been deputy governor and chief economist. He was born in 1948 and studied at King's College, Cambridge and Harvard University. He taught economics at Harvard, MIT, Cambridge and Birmingham Universities, before becoming Professor of Economics at the London School of Economics in 1984. 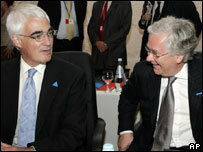 One person he taught at Cambridge was Bob Parker who is now deputy chairman of Credit Suisse Asset Management. "If you'd asked me the question over 30 years ago 'did I think that he would eventually end up as governor of the Bank of England' I think the answer was no," he says. "He was very likeable, very personable, very friendly, very approachable; taught economics in a very clear, easy to understand way," he adds. He left academia to join the Bank of England in 1991 and so was there when the Bank was given independence to set UK interest rates in 1997. Mr King was put in charge of the new quarterly inflation reports, which he worked on with Danny Gabay, who is now director of Fathom Financial Consulting. "He adopts a very intellectual approach, and always did, to the Bank of England's work, which I think has borne fruit," he says. "He is a serious person, particularly when it comes to policy, but he has a lighter side as his frequent references to sport in his speeches (show)," he adds. Mr King has been a member of the Bank's interest rate-setting Monetary Policy Committee (MPC) since it first met in June 1997. and is the only member who has attended all 125 meetings so far. He was originally thought of as something of an inflation hawk and in June and July 2002 he was the only member of the MPC to vote in favour of a rise in rates. But Professor Stephen Nickell, who used to be a member of the MPC, says that he never tried to dominate proceedings. "He was very punctilious about allowing everyone to have their say and never attempting to dominate or force his own views on others," he says. "I think this is one of the reasons why the MPC continues to be a success," he adds. In June 2007 he was outvoted in a 5-4 vote in favour of keeping rates unchanged, but Professor Nickell says the governor will have had no trouble dealing with that. "He is a great and loyal Aston Villa supporter, which shows that he's very capable of coping with disappointment," the professor says.